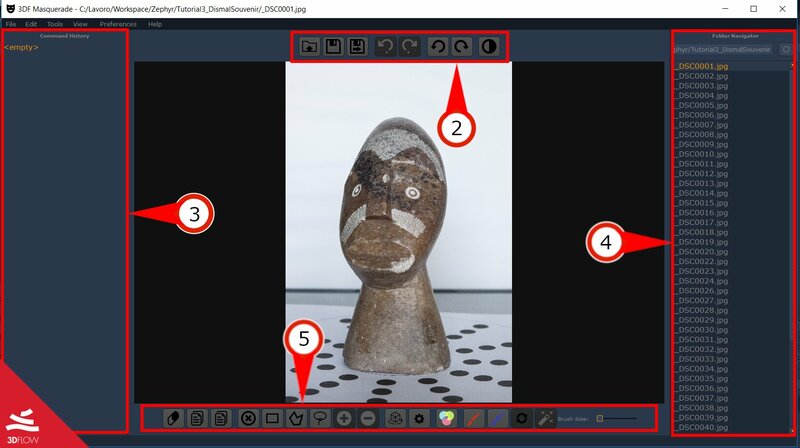 In this recipe, you will learn when and how to use 3DF masquerade to mask images. This feature requires 3DF Zephyr v 1.100 or higher. 3DF Masquerade is bundled and distributed in all 3DF Zephyr versions: with 3DF Masquerade you’ll be able to mask certain images. This is particularly helpful when there is a lot of background noise or when the subject has been moved incoherently with the background: the most common scenario is a subject that is being acquired on a turntable: since the object is moving but the background wall is not, if the background has enough features sometimes Zephyr might try to set the camera for the background rather than for the actual subject. The solution is to mask the background with 3DF Masquerade before processing the images. 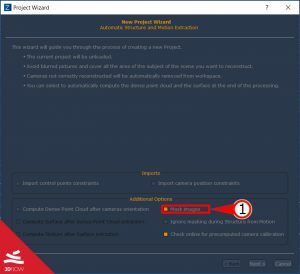 3DF Masquerade has been developed as an external executable, so you can either launch it from the Tools menu or during the “Masking” phase in the “Project Wizard” (1b). If the mask (.bim file) is saved in the same directory where the picture is saved, Zephyr will automatically pick it up when adding pictures. You can safely mix unmasked images with masked images. 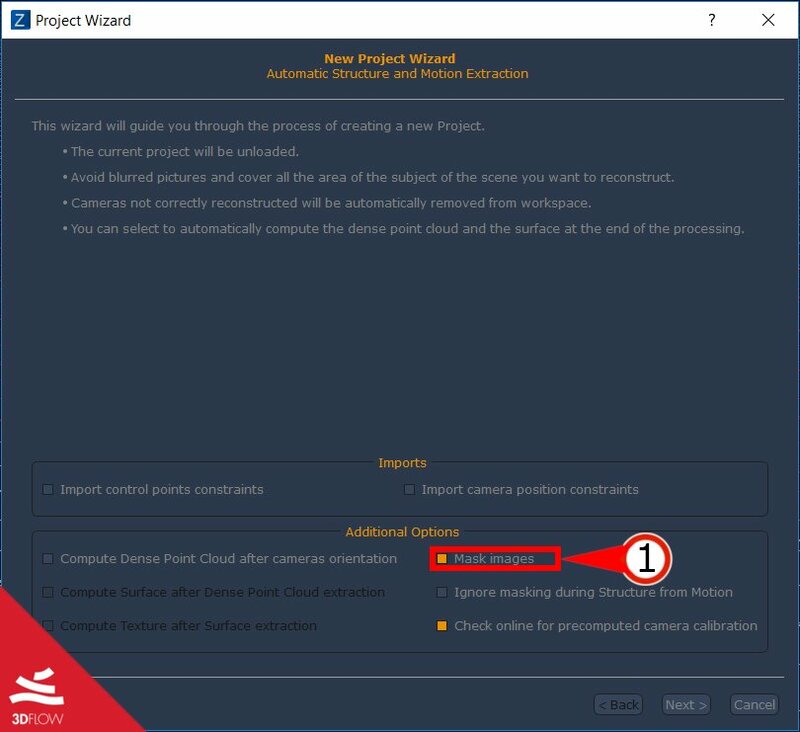 This time, run Zephyr with the same settings described in step 1 but remember to pick “mask images” (1) during the “New Project Wizard” under “Additional Options” tab. (7) Copy the current mask on the next image, this will replicate the mask on the next image. (15) Use a special algorithm to automatically compute a mask specified for turntable setup (for autocompute mode). (16) Automatically compute the next image automatically, by trying to propagate the current silhouette mask red/blue strokes to next image (for autocompute mode). 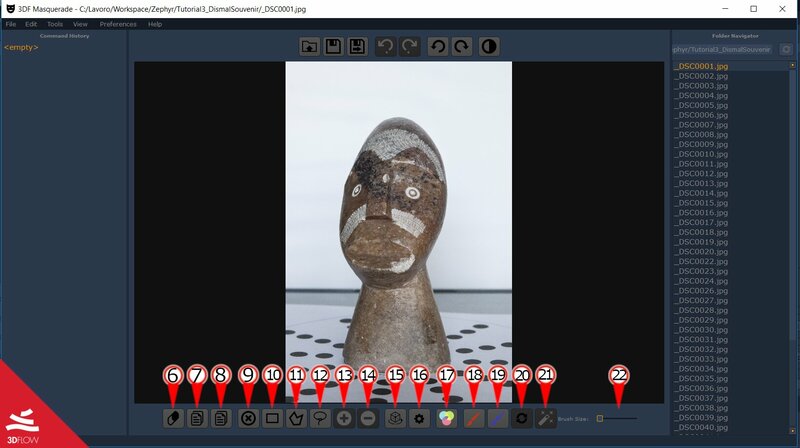 (18) Use this tool to mark what you want to include in the mask (for autocompute mode). (19) Use this tool to mark what you want to exclude in the mask (for autocompute mode). 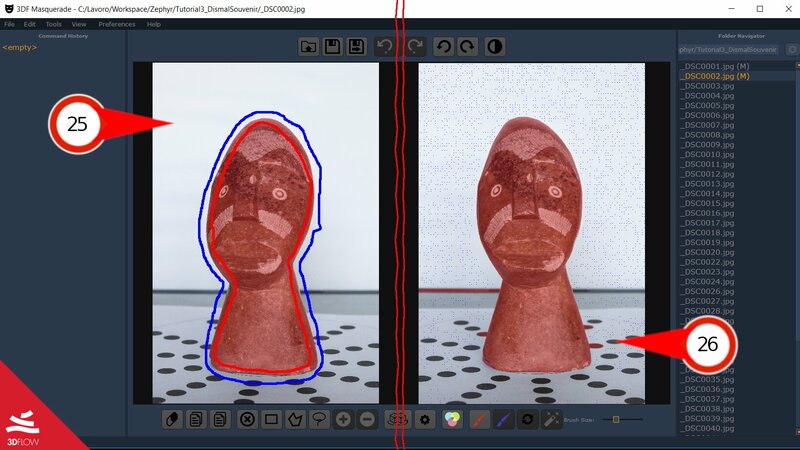 When masked, the selection area will turn red (using the manual tools (10,11,12) will show a blue outline while you are defining your shape). 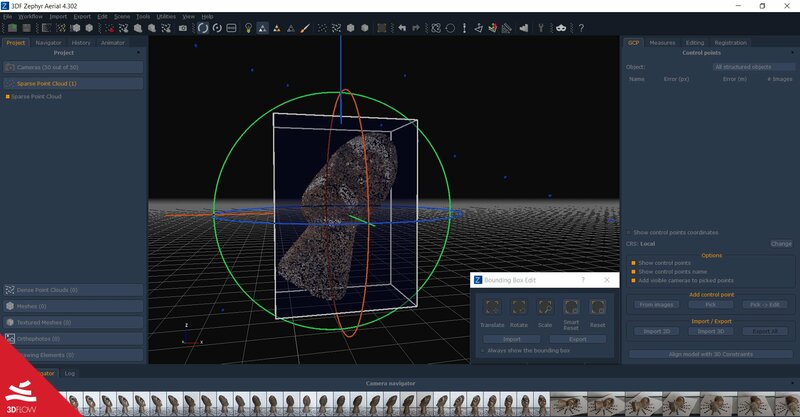 When using these tools, you can add areas by keeping pressed the left control key or subtract areas by keeping pressed the left shift key when doing the selection. You can undo actions by pressing CTRL+Z or simply by clicking to the command you want to revert back to in the command history section (3). To zoom in / out you can use the mousewheel up/down ; panning is done by moving the mouse while holding the mousewheel button down. The brush tool (also known as silhouetter tool) require you to define at least one foreground stroke (red) and one background stroke (blue). Everything selected by the blue stroke will be masked out. 3DF Masquerade will use its novel algorithm to propagate automatically the mask – high contrast between background and foreground help Masquerade in doing this automatically. You can quickly switch between the two strokes by pressing left shift+left click. The brush size can be changed with the brush size slider (22). This tool is especially useful when the background has a very high contrast compared to the object. You can delete existing strokes using the right click. 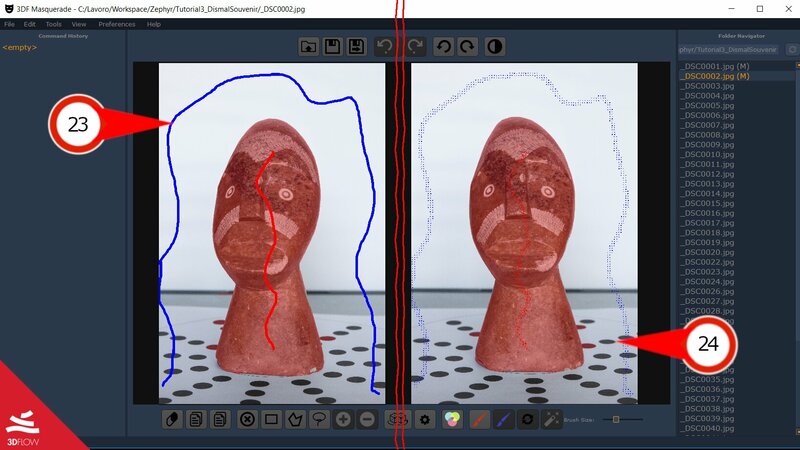 Pictured below, an example of the auto advance mask tool: on the left (23), _DSC0001.jpg has been manually masked by the user using the red stroke for the statue (foreground) and the blue stroke for the background. On the right (24) you see what happens to _DSC0002.jpg automatically when the user clicks the “compute mask automatically” button (16). Similarly, on the left (27) the same setup as defined in the step above. However, on the right (28) you can see how the background is automatically propagated after the user clicks the “compute mask automatically” button (16) while the turntable mode (15) is toggled on. 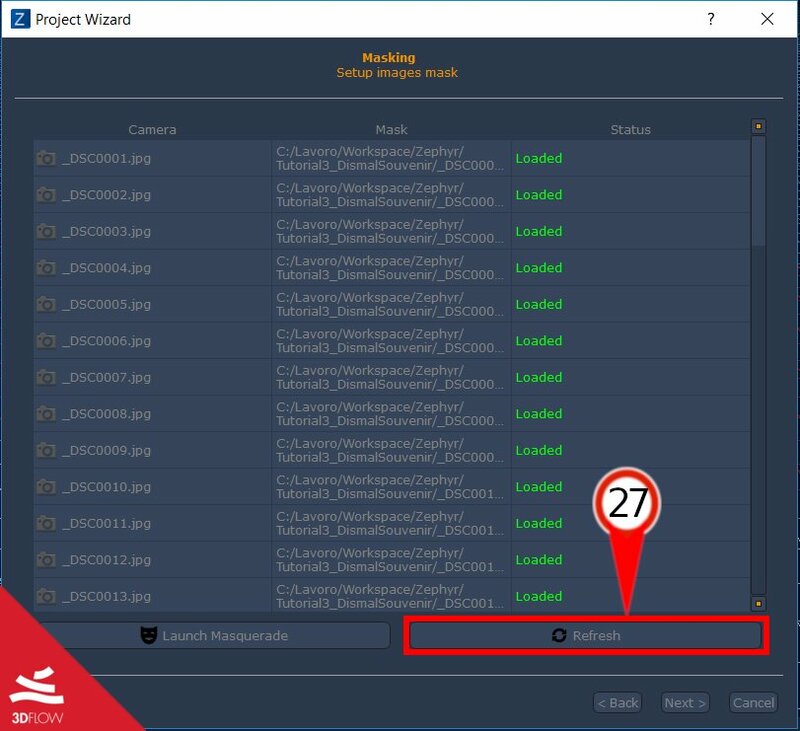 All mask files (.bim) in the current directory will be detected automatically – however, if you launched 3DF Masquerade from 3DF Zephyr, it may happen that switching back to 3DF Zephyr won’t load the masks automatically – in this case, simply click “refresh” (29). Masking can be a daunting task given a high number of pictures, so we strongly encourage taking good pictures when possible. However, masking out large portion of images will considerably speed up the computation process since masked out section won’t be computed at all. 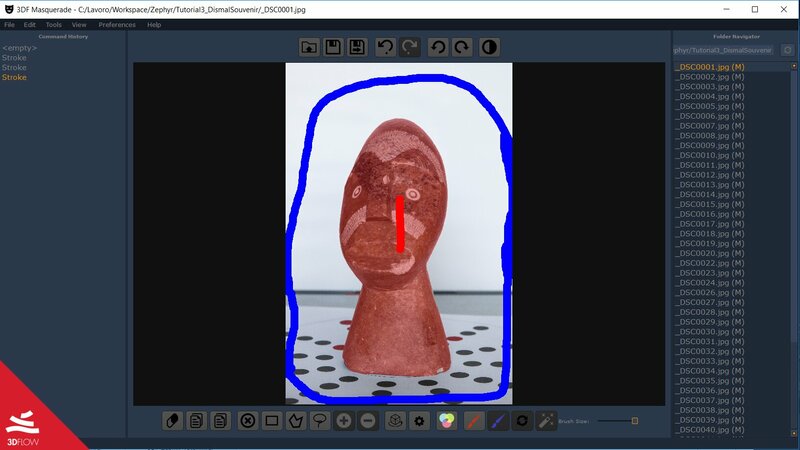 The next tutorial will show how to manage multiple objects in 3DF Zephyr’s workspace. Click here to proceed to the next tutorial.